One of the two suspects arrested for the murder of Cletus Onyekwele, a staff of Shell Petroleum Development Company of Nigeria, Rumuobiakani, Port Harcourt, said they killed him because he was over working them. 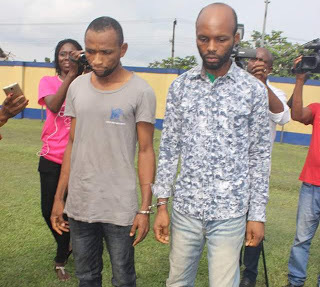 The two suspected murderers, Kingsley Nwankor and Joseph Francis, were paraded by the Rivers State Police Command last Friday, at the command Headquarters. The state Commissioner of Police, CP Zaki Ahmed said late Cletus Onyekwele was murdered in cold blood in his office at Rumuobiakani, Port Harcourt on 13th day of April 2017. Speaking to Daily Trust journalist, Kingsley Nwankor said the deceased had been a thorn in their flesh for giving them too much work to do. “When we entered late Onyekwele’s office, my colleague, Joseph, asked him questions about our job. At that point the deceased flared up and wanted to fight Joseph. I held the deceased by the hand while Joseph hit him severally with a wooden object,” he stated.